Dubai UAE, February 23, 2019: Making its hotly-anticipated return for 2019, Dubai Modest Fashion Week is back in Dubai on March 7th, 8th and 9th, at a glittering new location, showcasing the best of the world's modest fashion designers from over 26 countries. Taking residence at Emerald Palace Kempinski- miX by Alain Ducasse, one of The Palm Jumeirah's newest and most glamorous locations, the second edition of Dubai Modest Fashion Week is a celebration of women's empowerment. The event also centres around one of the most significant dates in the calendar - March 8, International Women's Day. Diversity is a key focus of Dubai Modest Fashion Week, with designers of all nationalities celebrated, along with People of Determination who will also be represented at the three day event – showing that modest fashion's inclusivity has no boundaries. ‘We see ourselves as the guardians of the industry, not the authority. We are here to support, nurture and highlight modest fashion talent from all over the world' - says co-founder, Ozlem Sahin. Founded by self-funded fashion entrepreneurs Franka Soeria and Ozlem Sahin under their company Think Fashion, the Modest Fashion Week series is created to bring modest design to an international audience. Since its launch in May 2016, Modest Fashion Week has succeeded in making headlines across the world, grabbing the attention of the media's biggest fashion and news titles, and introducing this burgeoning marketplace to a global audience. ‘We never imagined that we will reach this amazing milestone', says co-founder, Franka Soeria. Further cementing this as the modest fashion event of the season, designers from more than 26 countries will be travelling to Dubai to showcase their collections, network and empower one another throughout this exceptional event. 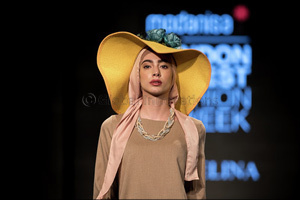 Dubai Modest Fashion Week is running from March 7-9 at Emerald Palace Kempinski Dubai. DMFW 2019 is organized by Think Fashion & Red Connect.